Coca-Cola India, one of the country’s leading beverage companies, today announced the launch of ThumsUp Charged No Sugar, the company’s first home-grown beverage to be offered in a no sugar variant with the same strong taste and extra thunder. The introduction of the new variant is a step towards Coca-Cola India’s commitment to promote moderation and offer people the choice of regular, low-sugar and no-sugar options to choose from. Consumers can now enjoy their favouriteThums Up taste with the same taste while staying conscious of their sugar intake. To connect with its core drinkers, Coca-Cola India has unveiled a creative and innovative marketing campaign in association with Marvel. 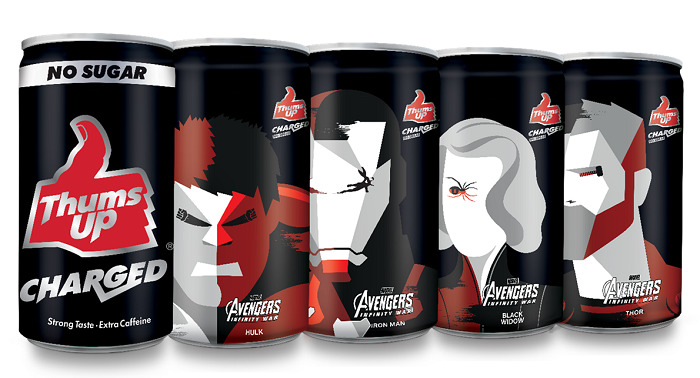 The cans and PET bottles of ThumsUp Charged No Sugar feature illustrations of four Marvel Avengers Super Heroes namely Thor, Iron Man, Hulk and Black Widow. These superheroes share the attributes with the brand which is constantly challenging themselves to unleash their true potential. This association is expected to deepen the company’s engagement with millennials and youth. The multi-faceted campaign includes TV Commercials featuring the Avengers, along with promotions on the brand’s social media pages across YouTube, Facebook, Twitter and Instagram. Thums Up, the flagship brand encourages ‘Never Settle For Less’ and epitomizes the ‘Go get the superior’ attitude. This grit and will personifies the strength of the strong-tasting cola. The company is also undertaking on-ground activations including sampling across 14 cities, exclusive movie previews and in-store branded displays across modern trade. For further information on the company's India operations and its products, please visit: www.coca-colaindia.com and www.hindustancoca-cola.com.